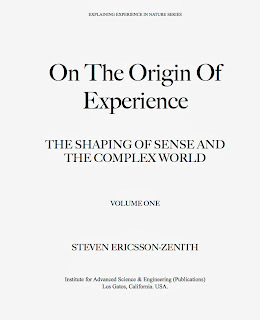 The full transcript of this lecture, including the first chapter of "On The Origin Of Experience: The Shaping Of Sense And The Complex World," is available here. Ericsson-Zenith, Steven. 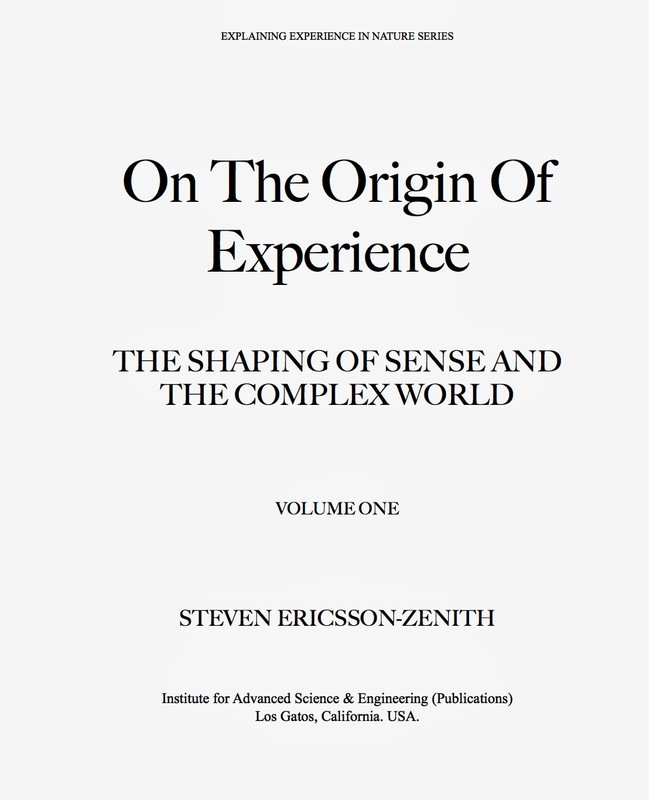 On The Origin Of Experience : The Shaping Of Sense And The Complex World. Institute for Advanced Science & Engineering (Publications). ISBN XXXXXXXXXX. 2017. Just as I was about to submit this book for broader review, I realized that I had taken the steps necessary to illustrate exactly how a theory concerning experience as sense in biophysics fits into the physical sciences in general. And it seemed to me that this really needed to be elaborated in this first book. So the book will now appear in two volumes since the changes will need to be propagated through the related work I have on the tensors and functors involved. The second volume will focus on details in this regard, presenting a comparison of my experimental approach with standard complex analysis. I am happy with this approach and feel the first volume will now be more accessible, and make a stronger argument. Hopefully, the delay will be no more than a month or, maybe, two of writing and then a broader review - subject to the mundane matters of life staying out of my way. In the meantime I will be reading from the first volume at Stanford University on November 13th, 2013. In that lecture I will read the first part of the book. I expect between 7000 and 9000 words that layout the new form (about an hour in length), and then 15 minutes or so of Q&A. The lecture will be streamed live and recorded, available subsequently through Stanford's usual channels on iTuneU and YouTube. "In every form of material manifestation, there is a corresponding form of human thought, so that the human mind is as wide in its range of thought as the physical universe in which it thinks." Benjamin Peirce, Linear Associative Algebra, 1870. How are we to explain the presence of our experience in the world and its many forms? This book is the product of a research journey to answer this question that begins for me in the corridors of the University of Arizona in conversations with Oxford mathematician Roger Penrose. In March of 2003 we participated in a meeting that asked whether advances in quantum mechanics and biophysics informed us concerning the nature of the mind. It has always been my intuition, however, that the limits of logical description he refers to are not limits of the world or failures of mathematics in general. They are, rather, indications of a failure in the foundations of mathematical logic, they are failures of a particular method. It seemed to me, therefore, most likely that resolution could be found by an inquiry into the nature of computation. I am especially concerned that the immediate continuous transformation of structure, as holistically conceived by a mathematician and evident throughout biophysics, is not reflected naturally in any of Turing's methods of systematic computation. This fact passes unnoticed at the scale of computing familiar to most of us. And this has seduced many to believe that computation is invincible. But it is now clear that the efficiency of Turing computation decreases as the problem size increases with physically limiting consequences at large-scales. These consequences will ultimately lead me to exclude Turing's models of computation from biophysics. As a keen scholar of recent biophysical results, funded for other causes often far from basic research, I had long suspected that the attempt to mathematize biophysics promised to inform the foundations of logic. It seemed to me impossible for biophysics to make progress without an exact account of experience as sense. And so as I listened to Penrose's ideas and concerns a contrary approach to the problem came to mind. My approach then is simple to state, it is to ask what methods are required to enable a mathematical description of the different forms of sense, how they are modified, and the role that these actions play in the operation of biophysical structure. Sense in this case is simply the variety of experience. Specifically, the goal of such an approach is to illustrate how a particular sensation is formed and modified in biophysical structure and the role that this action plays in the selection and performance of directed and non-directed response. And further, to describe how this basic mechanism combines to construct the entire experience of individuals and the operations of the familiar mind. In addressing this question I illustrate in exact terms how my solution takes its place in the physical sciences. The purpose here is to present the theory in sufficient detail to a broad audience, across disciplines. It includes the mathematical framework of the theory and its immediate implications to physics in general, logic, and computation. In the process I treat logic as a natural science whose mandate is to construct the bridge between pure mathematics and the physical sciences. Steven has been invited to lecture at Stanford University in the EE380 Fall and Winter quarters. Both events will be recorded and subsequently available via Stanford's presence on iTunesU and YouTube. The Shaping Of Sense And The Complex World. This Fall lecture will introduce Steven's new book. His life and contributions to logic and "The American Enlightenment." "2014 is the centenary of Charles Peirce's death, so I am particularly pleased to be invited to give this talk at the start of the year. I plan to place Peirce in the broader context of nineteenth century intellectualism and the development of Harvard University at the time." In this presentation we propose realizable mechanisms for computable logic founded upon a structural theory of logic, sensory characterization, and response potential in closed manifolds. Briefly, the mechanics of differentiation, in which the mechanisms of sensory characterization play a role, upon the surface of a closed manifold characterize logical elements (signs) and naturally covary with the mechanical response potential of the structure. The manifold provides a natural, continuous, and unifying dynamics binding these elements. Inference is a transformation of the manifold. We suggest that these mechanisms are observable in nature. In biophysics it is structure and the concurrency of action that are first-order considerations. It is the shape of single cells and multicellular membranes ( “closed manifolds” in mathematical terms) that characterize sense and modify action potentials that produce behavior. A generalization of the existing evidence suggests that symbols form directly upon the surface of these manifolds in cell and membrane architectures, the processing of which constrains biophysical action potentials associated with the structure. This close binding of symbol processing and action potential is naturally formed by the evolutionary process. Symbolic processing in the biophysical system is profoundly efficient. Storage is free and the capacity for symbol representation is combinatorial across dynamic sensory manifolds. This simple efficiency suggests general engineering principles that offer significantly greater symbolic processing capability in biophysical architectures than previously considered. In contrast, parallel computation as we understand it today is decomposable, a second order consideration of the Turing model. Parallelism can be semantically removed from computer programs with no discernible effect upon the results. Therefore it contributes nothing algorithmically, providing only performance semantics. The parallelism that we consider here makes a difference. As in biophysical systems, structural parallelism is not decomposable without impact upon the results. It plays a role algorithmically, providing the mechanisms of recognition and memory in the surface conformations of the processing architecture. Large scale differentiation appears in the dynamics of these closed manifolds and result in measurable characteristic behavior suggesting new architectures for recognition and prediction. Two opposing views concerning the nature of Logic will concern us. The first, represented in the variety of models of computation considered by Alan Turing, is the view that logical operation is the integration of symbolic elements. The second is the view, suggested by Rudolf Carnap, that the basic relation is “recollection of similarity” (recognition) and computable Logic is “differentiation from the entirety of sense,” in which symbolic elements are continuously bound by the originating whole. Our goal here will be to show that these two views, and the realizable mechanisms that they represent, are distinct and that their operation produces different results. In particular, the models of Alan Turing represent a metaphysical view in logic that has no capacity for the basic relation of Carnap and results in prohibitive storage and value distribution requirements. To effectively construct such machines we require the development of a new computational logic, one that deals with differentiation, structural conformation, and related action potentials. We will outline our first steps toward such a logic. This approach suggests a new pragmaticist foundation for logic (and potentially a new mathematics to be built upon it) since it eliminates the integration of traditional truth values in favor of symbolic differentiation upon closed manifolds and the transformation of the associated structure. 1. Turing, Alan. On Computable Numbers, With An Application To The Entscheidungsproblem. (1936). 2. Turing, Alan. Intelligent Machinery, A Heretical Theory. (1951). 3. Carnap, Rudolf. The Logical Structure Of The World. Open Court (1928). ISBN:0812695232. This presentation is an invited talk for the conference The Incomputable, an Isaac Newton Institute for Mathematical Sciences event held at the Royal Society's Chicheley Hall in England in June 2012. The Incomputable is a major workshop of the 6-month Isaac Newton Institute programme - "Semantics and Syntax: A Legacy of Alan Turing."